In 2006, the Governor’s Office of Planning and Research collaborated with local, state, and federal stakeholders to develop and publish an Advisory Planning Handbook in compliance with SB 1468 (Knight, Chapter 971, Statutes of 2002). This 2016 update expands upon the 2006 Handbook with new and updated descriptions of processes, tools and strategies, new case study examples, and a new interactive PDF format, with links and pop-up text to enable easy navigation to specific areas of interest. The Handbook’s primary purpose is to guide city and county planners, property owners, developers, and military personnel on how best to engage and collaborate on proactive planning efforts, to encourage land use compatibility, and to reduce encroachment on military installations and operating areas. 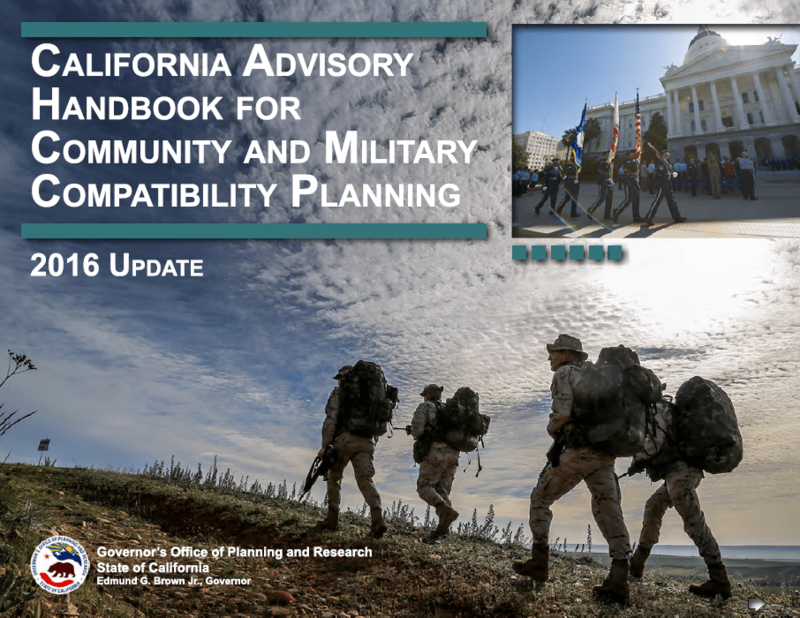 The Handbook contains a menu of available planning tools, best practices and processes, and case study examples that demonstrate successful efforts to achieve or maintain compatibility between community land uses and military activities. This information will enable local planners, builders, and the military to share information and communicate in a timely and cooperative way so that all parties can make fully informed land use decisions. The Handbook also provides advice to cities and counties as they revise and update their general plans. This Handbook is intended for community and military planners, property owners and developers, and anyone interested in supporting our nation’s military readiness. Community planners can use the Handbook to better understand military mission footprints and encroachment concerns, while military planners can use it to better understand local plans, programs, and planning processes as a precursor to effective community outreach and engagement. The Handbook is also a valuable resource for property owners and developers who need to understand potential site-specific development constraints – and opportunities – in the vicinity of military installations and operating areas. The updated 2016 Handbook is designed to be interactive and user-friendly so you can easily navigate to your areas of interest and quickly access key information most applicable to your current needs. For example, a military planner can bypass information about military operations and go directly to the section on community planning or to descriptions of specific planning processes or issues.